EDMONTON, AB – No titles exchanged hands at WWE LIVE: Road to Wrestlemania’s stop at Rogers Place on Friday, but you can bet hands were exchanged. Two fighters, three fighters, no disqualifications, Tag Team Championships, you name it – WWE brought the punches and body slams down on the venue for supremacy in a 20 by 20-foot ring that had the full attention and energy of those in attendance. Drew McIntyre, the Scottish powerhouse, taunted the crowd to start the night’s first tilt before Dean Ambrose’s intro music and descent from the ramp meant pleasantries were over. It was straight to the action, and fans in the front rows quickly learned that it wouldn’t be limited to the ring as bodies hit the barricades. Despite the crowd in Rogers Place definitely being on the side of Ambrose, McIntyre’s strategy of poking the ref’s eyes allowed his escape from submission to then seal the win shortly after by tap out. The next all-women matchup had a local connection with wrestler Natalya from Calgary fighting against Tamina. It was an easy win for her with a submission, before she was kicked around by the tag team Riott Squad, in what would not be their only appearance of the night. Elias’ in-show concert, including his prepared song touting Sidney Crosby from his hometown Pittsburgh Penguins over Connor McDavid, had the plug pulled on it early by the team of Curt Hawkins and Zack Ryder. The duo then had to duke it out with The Acension, who together totalled more than 420 pounds. The fight for the belt of Intercontinental Champion, held by Bobby Lashley, would be a three-way bout after Apollo Cruz wouldn’t let EC3 steal his thunder. Lashley, in the end, retained his title. The Revival retained the WWE Tag Team Championship despite too many close counts that almost ended the match against Bobby Roode and Chad Gable. Revival may have won the belt, but Roode and Gable won the applause of those in attendance. The ring had its highest body and aerial counts in a six-man tag team battle featuring Lucha and the Singh Brothers that went the way of the luchadores. Before counting out the Singhs, a backflip from the turnbuckle by Lucha was the decisive manoeuvre. Riott Squad was back to contest the Women’s Tag Team Championship, going head to head with the Boss n’ Hug Connection of Sasha Banks and Bayley. Riott Squad ultimately took a beating in the title fight. No disqualifications in the night’s final match between Braun Strowman and Barin Corbin meant no mercy. 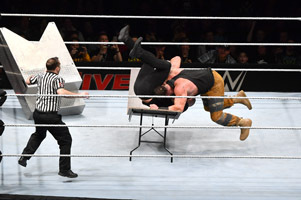 Strowman delivered the finishing blow through a table pulled from below the ring, slamming Corbin into submission as the bell rung for the final time. The Road to Wrestlemania is paved with body slams and submissions, and the first-ever stop at Rogers Place delivered with a bang.